This page shows some examples of dealing with "time" coordinates. All "date" functions are documented here. 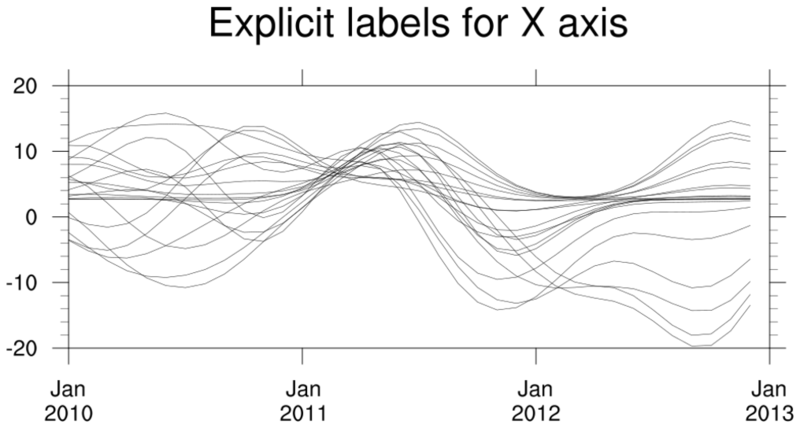 See the time axis labels page for examples of creating nice time labels on the X or Y axis. CAUTION: The yyyy-mm within a CESM file name and the time variable contained within the file may not necessarily agree with one another. This can be confusing and lead to erroneous temporal assignment(s). Consider a file named "CESM.sample.h.0280-01.nc". The file 'yyyy-mm' is 280-01 (January, 280). 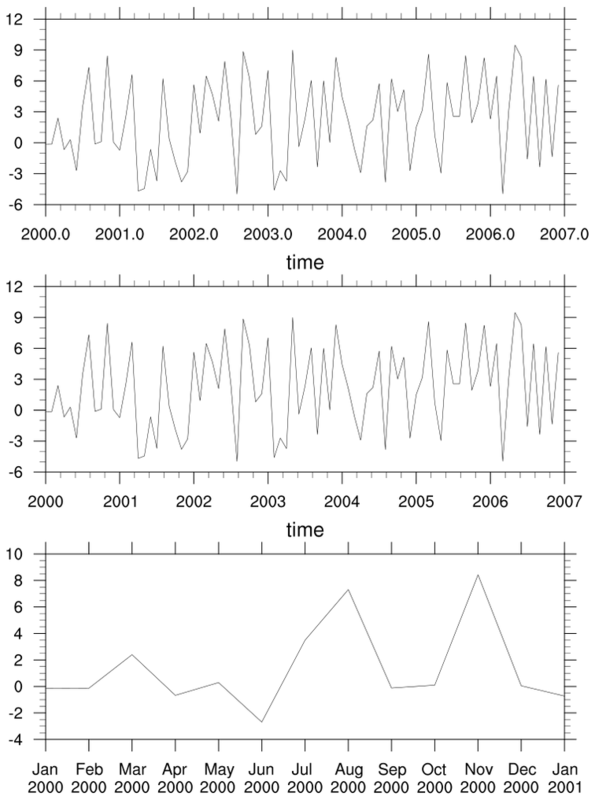 time_1.ncl: (a) Create an integer time coordinate variable of the type 199801,199802 etc for multiple years. (b) Convert to type string via tostring and sprinti. (c) Convert integer yyyymm to year and fraction of year for graphics via yyyymm_to_yyyyfrac. (d) Create a time variable with the units "hours since ...". time_2.ncl: Demonstrates using cd_calendar to convert a mixed Julian/Gregorian date to a UT-referenced date, and then demonstrates using cd_inv_calendar to go from a UT-referenced date to a mixed Julian/Gregorian date with a different reference time and units. The sprintf is used to ensure consistent formatting of the yrfrac variable. YYYY14, through YYYY99, causing irregular gaps in the data. trailing zeros from the X axis labels. returns in tick mark labels so that the year label appears under the month label.